One of the most interesting stories to come my way lately arrived by email from Robert Phillips, a retired U.S. Naval Admiral. Adm. Phillips acquired a racing Ferrari in 1960 when he was a young officer and he owns the car to this day. For the full story please read "Cavallino Magazine" #171. For copyright reasons I can't reprint it here. In May 1960 Adm. Phillips, then a young Lt. Junior Grade, found a badly abused racing Ferrari 0556(0446)/MD in a Richmond, CA, Rambler dealership. He spent the next nine months repairing the car and preparing it for competition. He started with zero experience and taught himself the necessary skills as he went along. It took Phillips nine months to repair all of the engine, transaxle and body damage. To finish up he painted the car with six coats of red lacquer. In March and April, 1961 Phillips drove his car at the RDC (Racing Driver's Club) driver's school at Cotati Raceway near Santa Rosa, CA. The SF Region of the SCCA required completion of "RDC" training for a driver to obtain a Novice Driver's Permit. 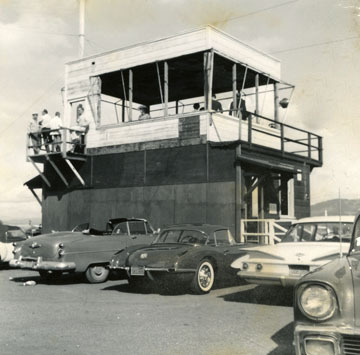 Photo shows the Race Control tower at Cotati in April 1961. 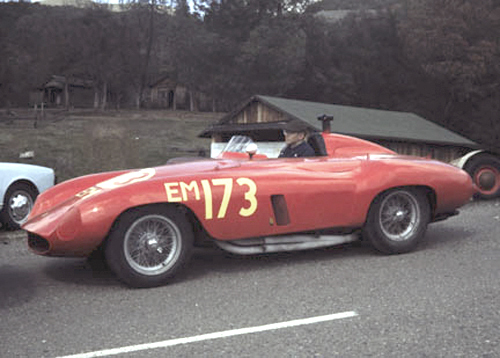 Phillips' first competitive event was the Georgetown Hill Climb (sometimes called the Sierra Hill Climb) on 26 March 1961 where he broke the previous year course record, placed 10th overall and 1st in class E with the car number 173. Photo at left shows Phillips in the Ferrari at the hillclimb. On 15 & 16 April 1961 Phillips raced the car at the SCCA Stockton Sports Car Races. In Sunday's modified main event won by Chuck Sargent in his Birdcage Maserati, Phillips placed 8th overall and 3rd in Class E. Incidentally, the car in 6th place overall was the Rod Carveth 250 TR (0666). After the Stockton race the navy sent Phillips to Turkey for two years. In 1964 he was reassigned to the Naval Supply Center in Bayonne, NJ. He retrieved his Ferrari in California and drove it to Staten Island, NY. From Phillips: "I doubt that anyone else has ever tried that in a Lampredi four! There are many stories about events on that trip including the snowstorm encountered crossing the continental divide in New Mexico." More from Phillips: "I retired from the U. S. Navy as a Rear Admiral in the fall of 1988. Over the past eight years I have rebuilt all of the mechanical components with help when I needed more than one pair of hands coming from my wife HelenAnn, my son Bryan, and good friends Michael Bayer and Bill Bowdish. Through the meticulous care of David Carte and his crew along with the aluminum magician Craig Naff and electrical guru John Whittington the balance of the car was preserved, restored, conserved for the future. In January of 2008 my old friend Alan Boe decided that my slow rate of progress needed a boost and nominated the car to the selection committee at Pebble Beach. Somewhat to my surprise the committee elected to invite my car to be shown in August of 2008. At Pebble Beach, I enjoyed briefing the judges on the history of my car and its peculiarities and also had the opportunity to show Piero Ferrari segments of the Presentation book and the period racing photos as he walked the field. Frankly my wife HelenAnn (my first Testa Rossa), my son Bryan and I were all delighted to simply be on the Concours field at Pebble Beach. So it was pretty exciting when we were asked to proceed to the holding area for cars receiving awards. Of note, this was the first time that HelenAnn had ever sat in much less ridden in the car, because before now it was just a dirty old race car with a cover over the passenger seat. After seeing the other two selected cars being sent off to the awards ramp to receive the third and second place trophies, it sunk in that we were getting the 1st in Class award. After receiving that award we were startled to see Chairwoman Sandra Kasky Button smiling and handing over a second trophy to us, the Enzo Ferrari Trophy for the best Ferrari in the field as determined by Piero Ferrari and Jean Todt from the list of recommendations by all of the Ferrari Class judges. At that point I would not have been surprised at all if I had awakened from a wonderful dream to find myself back in the room. Unbelievable! Forty eight plus years of ownership, endless stories, and now a fairy tale ending to this chapter for a first time visitor to the Pebble Beach Concours d’Elegance. Too many people helped in this incredible journey for me to thank them all but I must single out David Carte as the perfectionist who helped push me to this level. I would be remiss if I did not express my appreciation to my original, one-of-a-kind "testa rossa", my dear red headed wife HelenAnn who has tolerated my car antics, although she admits some race dates were multiple Valium days. She also gave me my neat son Bryan who started his Ferrari ownership with a big beautiful beast, a 365 GT 2+2. They both pitched in on many of the various jobs necessary for completion of this major conservation project. I feel that I am one lucky man." On 8-1-09 Phillips drove the car on track at Road America: (Video shot by Bryan Phillips). Your webmaster doesn't know where or when the following videos were shot.